This traditional side dish goes right on the table with the turkey and stuffing. 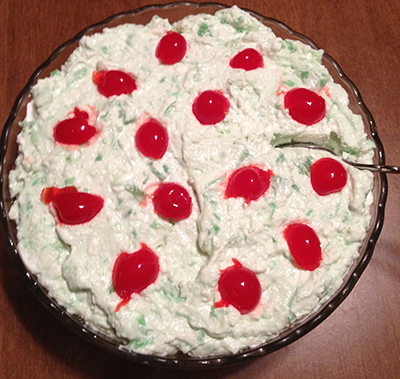 A traditional dish served at my family’s table for Thanksgiving is lime gelatin salad. I can’t be certain where it all started, but my grandmother passed her recipe down to my mother, who has granted me permission to share it with you all. Although this sounds like a dessert, it actually goes well with all the other fixin’s, which why we pile it on our plates alongside the cranberry sauce and mashed potatoes. Dissolve the gelatin in the boiling water. Stir in the pineapple and chill until partially set (about 45 minutes). Combine the cottage cheese and cream cheese with a mixer until well blended. Stir the cheese mixture and gelatin together. Keep this dish chilled until ready to serve. Oh, and Mom says if you let the gelatin set too much, use a mixer to combine it with the cheeses. Any texture of the salad should come from the cottage cheese and pineapple, not the gelatin.